Posted by themotochanneladmin & filed under Bobbers. 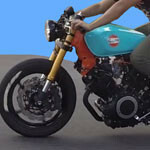 Jeffrey of JTEC MOTO in Los Angeles, California shows us his custom 1982 Yamaha Virago cafe racer. Upgrades include Yamaha R6 front end and rear Hagon mono shock. Rear wheel is from a second generation Virago. 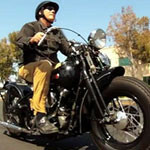 Scott McCrorie of Long Beach, California shows us his custom 1939 Harley-Davidson ULH. Hokan Martensson of Costa Mesa, California show us his beautifully restored custom 1947 Harley-Davidson FL Knucklehead Bobber.